Whether you’ve been a massage therapist for several years, or you’re brand new to massage therapy, eventually you will need to brush up on your skills with massage courses. Veterans and new therapists alike can choose between traditional classroom-setting massage courses and online courses- here, we’ll outline a few things you should consider as you decide which learning track is better for you. With online massage courses, the obvious benefit is that they are flexible. You can study whenever and wherever suits you- around your existing work or school schedule, your kids’ football practice, or whatever other activities take up your time. You don’t have to leave your house to go to a physical classroom. Online massage courses make your couch your classroom. There’s also the added benefit of a cost savings. Online massage courses tend to be less expensive than traditional classroom-style courses. After all, you’re not paying a teacher (you’re your own teacher), or to keep the lights on in a school. State-specific courses are just that: qualified for only that particular state. Courses certified by the National Certification Board for Therapeutic Massage and Bodywork (NCBTMB) apply nationwide. 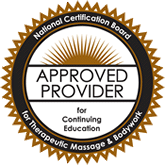 The NCBTMB’s recertification program requires that nationally certified massage therapists and bodyworkers recertify every four years, and if you chose the CE track, you must earn those credits from NCBTMB Approved providers such as Nirvana Massage. Getting your certificate with massage courses offered by Nirvana Massage is simple. We offer beginner, intermediate, and advanced courses to suit your particular needs, or you can select a CEU bundle and save 30%. Once you checkout, you will be able to download the PDF of your course and get studying! You’ll be able to study on your own time, using whatever study method works best for you (instead of being forced into a study method that might not be effective for you, as can happen in a traditional classroom setting). When you’ve familiarized yourself with the material in your course, follow the link at the end of the file to your test. All the tests are open book, and you can repeat them as many times as you need to in order to learn the material completely. Once you pass, you’ll get a printable PDF certificate that you can save in case you need it later. Want a more detailed explanation of the process? Check out our handy infographic! One final difference between classroom massage courses and online massage courses is that with Nirvana Massage, you can try the process out for FREE! We offer a 1 CEU Fibromyalgia course at no charge. This course gives you an hour of credit from NCBTMB. You can go through the simple process of downloading and testing, and can see for yourself how convenient and simple learning online can be. You don’t have to leave your house, buy any over-priced textbooks, or even change out of your sweats. It’s massage courses, your way.